An oblong repoussé vinaigrette with a hinged cover and with a short chain. All six surfaces are decorated. The flat top and the base are adorned with figures in a landscape setting. The top depicts two farmers seated against a tree, having a conversation, whilst a buffalo stands at the back. The upper right end has two female figures standing behind a fence, probably on the way to join them. The base has two literati sitting beside a tree trunk table on the top of which a book is opened. The four sides are adorned with grapes with tendrils and leaves. The edges of the box are minutely decorated with wavy rope borders. The inner hinged lid is decorated with a pierced and chased flower-and-foliage design enclosed by narrow stippled borders. 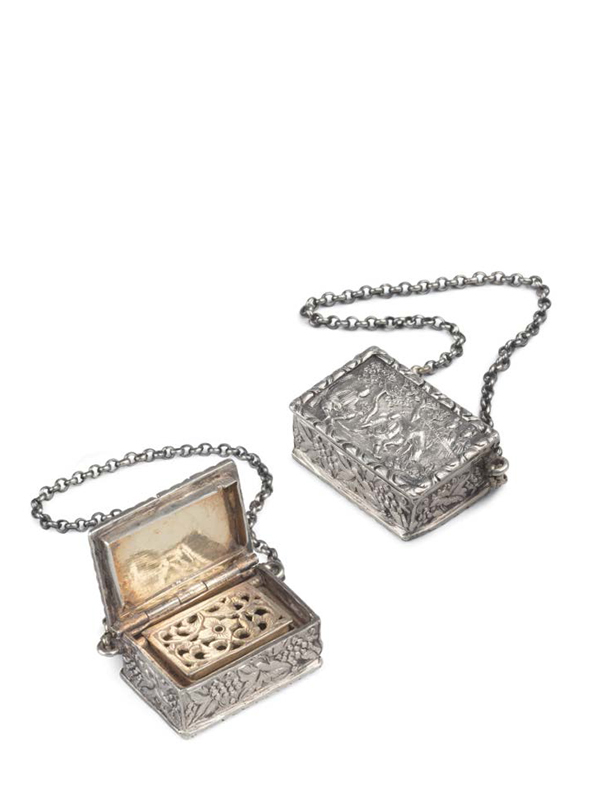 Silver vinaigrettes were used for carrying perfume and scents during periods of travel as a more accessible and practical alternative method from moving large glass bottles. The perfume, or aromatic vinegar, would be contained within these boxes soaked in a sponge, which was normally covered by a grille. It is a rare to find a Chinese export silver vinaigrette. Silver examples would always be gilded at the point where the sponge would touch the metal so as to avoid any corrosion. During the 19th century vinaigrettes were a fashionable indication of social ranking in Europe, as those who were able to afford perfume or concern themselves with their outward appearance at all were among the elite. 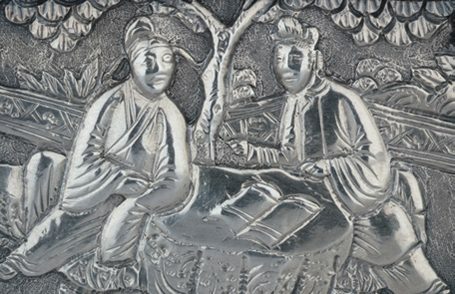 A very closely related example, similar in size, with a decoration of figures in a landscape and an inner hinged lid, a ring attachment on the side for a chain at one end and also dated to the mid-19th century, is in the collection of Mr. and Mrs. John Devereux Kernan and illustrated in Chinese Export Silver, 1785 to 1885 (fig. 1). Further comparable silver repoussé snuff boxes of oblong form but of various sizes and in different collections are illustrated in the same book. 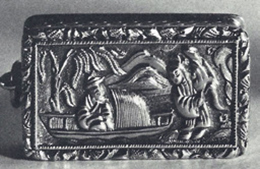 Another example of a silver vinaigrette repoussé, decorated with figures of an old man and a child picking fruit in a garden, is in the Chait collection.